How to stitch "back needle"
Seam "back needle" is used to design the contours of objects in embroidery stitch and cross and for the creation of an independent simple patterns. The technique of execution is similar to embroidery stalked seam. Draw on the fabric line, along which will run the seam "back needle". If you subscribe backstich (contour line) on the stitch or cross-stitch, to draw the line is not necessary. 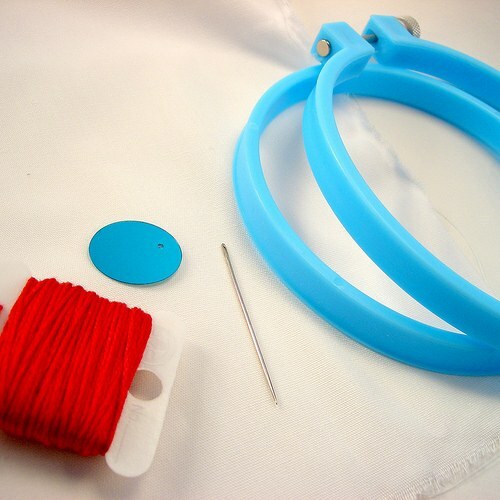 Place the material in a Hoop, without using this device you can pull the fabric filaments and deform the figure. Gently pull up the edge. Pass the needle thread. Tie a knot in it. Keep in mind that when you perform a seam "back needle" the flow of the working thread is rather large, so cut a long enough piece. Insert the needle into the material from the wrong side on the drawn line or along the contour of the embroidered object, pull, pull. Make a small stitch in the opposite direction of the contour lines, pierce the fabric with the needle, but do not put it completely on the wrong side. Enter the tip of the needle from the wrong side in the fabric, stepping back from the initial point of entry a small distance equal to the stitch length. Withdraw the needle and thread on the front side. Run the second stitch. To do this, insert the needle into the hole of the first insertion of the needle, from the wrong side will retreat to the length of two stitches, again, withdraw the needle on the front side. You will have two stitches. Try to keep their length was the same. The front side of the stitch looks like machine stitch, purl threads are "lapped". To contour was more dense, use thread of a few additions or forge next two or three parallel seam. Make sure that the length of the stitches they were the same. To create a self-ornaments pave the seam "back needle" on the drawn line, attach yarn on the wrong side. Then pass the needle thread of a different color, tie the end knot. Enter from the wrong side of the thread on the work surface next to the first stitch. Now all the work is done on the front side. Insert the needle into the first stitch, gently pull the thread, with the same hand, place your second stitch, withdraw the needle. You get two-tone snake. Secure the thread on the back side when the pattern will be fully implemented.